Rich with sour cream and two types of paprika, this yummy chicken dish will be a sure winner at the dinner table. 2. Season Chicken all over with Kosher Salt, Freshly Ground Black Pepper and add a dash of Smoked Spanish Paprika on the skin side. 3. Heat a Dutch oven over medium-high heat and add the Vegetable oil. 4. Dredge Chicken in Flour and knock off any excess and immediately place Chicken in hot oil, skin side down and cook until the skin is browned and crispy. 5. Reduce the heat to medium, turn the Chicken over and cook for an additional 3 minutes. 6. Remove Chicken to a plate to rest. 7. Add the 2 tablespoons of Butter to the pot to melt and scrape up some of the cooked bits from the Chicken. 8. Add the chopped Onion to the Dutch oven and sweat (cook stirring until the Onions begin to release their moisture). 9. Add Mushrooms and cook stirring gently for 2 minutes then stir in 1 tablespoon of Olive Oil and both Paprikas stirring for 1 minute more. 10. Add the container of Chicken Stock Concentrate and stir until dissolved, then add the Chicken Stock and bring to a boil. 11. When the stock is boiling, return the Chicken Breasts to the liquid, skin side up. 12. Cover and place in the oven. 15. Stir ¼ cup of the braising liquid from the pot into the Sour Cream mixture to temper and thin it slightly. 16. After 45 minutes, remove the pot from the oven to the stove top and transfer the Chicken to a plate covering with foil to keep hot. 17. Bring the braising liquid to a boil over medium heat. 18. Slowly add the Sour Cream mixture to the braising liquid, whisking until smooth. 19. Turn heat to low and continue whisking for 5 minutes until thickened. 20. 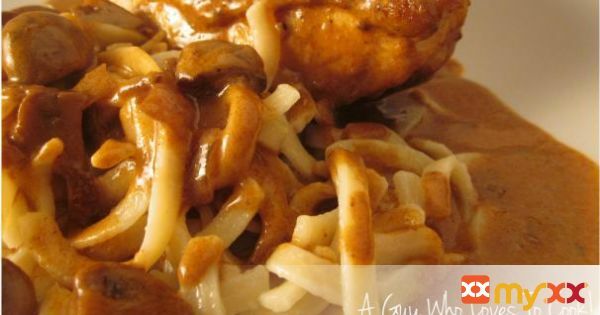 Serve with buttered Kluski style egg noodles, ladling the gravy over the Chicken and noodles. 22. To increase the quantity of available sauce, which is the integral component in this dish, make these changes: Double the quantity of red onion and mushrooms; increase the amount of sweet paprika to 2 tablespoons and the chicken stock to 2 cups; use 3 teaspoons of flour in the sour cream mixture. Of course, use 4 chicken breast halves!